In a quiet spot close to the beach, the attractive family run Draganikos consists of two buildings surrounded by their colourful gardens. 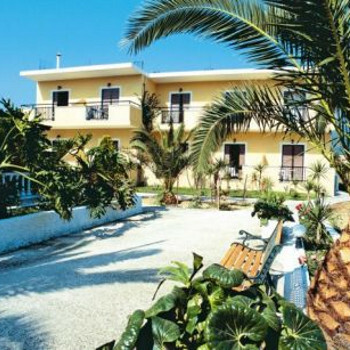 Popular with repeat bookers, they are also conveniently located for the facilities of Alikanas and the swimming pool. Excellent location very close to the beach & only a few minutes to the restaurants, shops & bars. No pool but there are plenty of pool bars you can use if you wish. Very pretty gardens & quiet at night. The apartments are very basic, no kettle or toaster & a hand held shower over a tray, no curtain. The beds were comfortable though & if you are not going to cook, quite satisfactory. The only drawback was the paper-thin walls, you can hear everything going on in the apartments around you - conversations footsteps,coughing,using the toilet (and I don't mean just the flushing!)etc. We were lucky and it wasn't too much of a problem for us, but had there been any children staying there, a courting couple or perhaps someone who snored or came in late at night,it would have been disturbing. Having said this I think it is a common problem in some Greek apartments. This is basic self-catering - no frills, no extras. But it is well worth a visit. Its location is excellent: off the main road, and only a few steps away from the beach. The garden is especially attractive and this adds to the air of peace and quiet about the accommodation. The furniture and fittings have seen better days and the place could benefit from a bit of an up-grade - but that did not detract from our enjoyment of it. The lady in charge was friendly and very helpful - but she has limited English and we had even more limited Greek. This is a typically Greek basic self catering apartments. The owner has a room you can use on your last day if you have a night flight for 20 euros which was well worth the money for us to be able to get some sleep before we left. The rooms are clean and airy and have plenty of room. If you want to make a cuppa whilst you're there you may want to take a travel kettle as there's not one of these in the rooms. There is a supermarket just up the road about 5 minute walk and along the high street are bars, taverna's etc. Really, pretty place to stay. Rooms very clean typical greek/basic but lovely. Brilliant location away from main strip - if you can call two dozen tavernas a strip!!!! Much better beach than next resort and literally 3 or 4 mins easy walk away. Dionysia (owner) lovely as were the people in the romanza restaurantjust 30 seconds walk away!!! Food there fantastic and your guaranteed a warm welcome. Although no pool your welcome to use the one at the opposite hotel(hotel valais)just buy a drink or two to keep the owners more than happy. We stayed at valais on last night due to night flight but all agreed dragonikos better. Only downside at the moment is no air con but can hire fans and it should be in for next year. We stayed at the Draganikos Studios and Apartments in Alikanas. The apartment was very nice and was cleaned everyday. The owners are very friendly and helpful it is set in a garden surrounding with lovely views of the sea and mountain. I would recommend it to anybody who wants a quiet and relaxing holiday. There is no entertainment at the apartments but there is a hotel/pub at staggering distance with very friendly staff and is open to all. Stayed in a studio within the accommodation and thought they were more than satisfactory. Pretty basic but large enough with a kitchen area that has a fridge, hob, sink etc. Other area has two beds, wardrobe, dressing tables. Separate bathroom area that is pretty small but more than satisfactory. Balcony is cosy and plastic table and chairs are provided. The location is excellent; the nearest pool (at the Hotel Valais) is only one minute away and the beach only two minutes away. The resort centre is only 10/15 minutes away. Maid service every day either to change/make beds or change towels. Owners are very friendly and approachable and I would definitely recommend this accommodation if you want good location and peace and quiet.